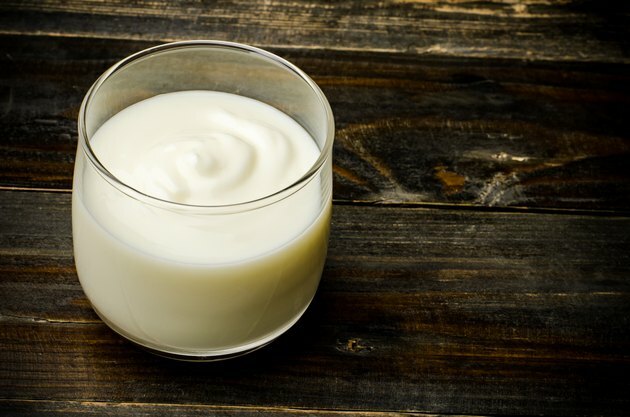 If you're allergic to milk, it is not advisable to consume any dairy product, including yogurt, according to the Lucile Packard Children's Hospital. If you've been diagnosed with a milk allergy, you run the risk of experiencing a life-threatening reaction called anaphylactic shock. A milk allergy is more common in adolescence than in adulthood, but can affect anyone at any age. This condition is incurable but treatable with diet modification and lifestyle changes. Consult with your doctor before eating any dairy product if you've been diagnosed with a milk allergy. A milk allergy is caused by a malfunction of the immune system. Milk is composed of two primary proteins, casein and whey, according to Kids Health. You may be allergic to one or both of the proteins. When you consume dairy products, your immune system reacts as if the body is under attack. Immunoglobulin E, or IgE antibodies are created to fight off the proteins. The introduction of IgE antibodies into the body's system causes mast cells to produce histamine, a chemical that helps protect the body from infection. Histamine is the chemical that causes most milk allergy symptoms. After consuming dairy products, you can develop symptoms within a few minutes or up to a few hours, according to MayoClinic.com. The initial symptoms that develop are vomiting, wheezing and hives. The body attempts to rid itself of the proteins as fast as possible and may cause diarrhea. As histamine increases in soft tissue throughout the body, inflammation and swelling will form in the lungs, sinus passages, skin and digestive tract. This can lead to abdominal cramps, runny nose, watery eyes, coughing, wheezing, shortness of breath, chest tightness, itchy skin, eczema and general inflammation in the skin. A milk allergy and lactose intolerance are commonly confused conditions because of similar symptoms. If you've been diagnosed with lactose intolerance, you may be able to eat yogurt because the live cultures in the yogurt help digest the lactose from the milk. A milk allergy is an immune system reaction that can affect your respiratory system, skin and digestive tract. Lactose intolerance is a digestive disorder that only affects the digestive system. Only your doctor can provide a proper diagnosis between the two conditions. If you eat yogurt with a milk allergy, you can experience anaphylactic shock, a rare but potentially deadly reaction. Symptoms of anaphylactic shock include a drop in blood pressure, lightheadedness, swelling in the throat, hives, bluish-colored skin and a faint but rapid heart rate.